Enjoy the summer in charming Orient Point. 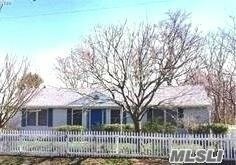 Sunny & spacious expanded ranch features 3 BR, 1.5 baths, Eat in kitchen, formal dining & living rooms, office and large den with sleeper. Sliders to wrap deck facing fenced yard with open land beyond. Minutes to Orient Beach Park (seasonal pass available) & popular restaurant. Owner open to shorter stay - minimum of 2 weeks. Cleaning fee additional. May consider house trained dog with additional security.